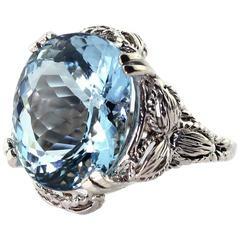 Incredible pair of vivid blue Aquamarine pear shapes, weighing a total of 18.59 Carats, and a total of 0.80 carats of round brilliant diamonds, are set together to compose this magnificent hand crafted platinum cocktail ring. Size 6. Resizing is complementary upon request. ***Returns are accepted within 7 days of delivery and will gladly be paid by us. Rings resized upon request, may also be returned. Diamond Cocktail Rings.